Welcome to June! We had 110 projects linked up in May - let's see what this month brings! 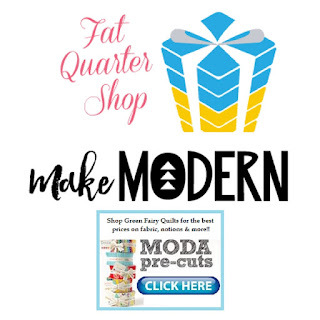 Green Fairy Quilts is a wonderful online quilt store that offers precuts, patterns and notions at prices that can't be beat. They are my source for precuts! Shipping is fast and the selection is wonderful. 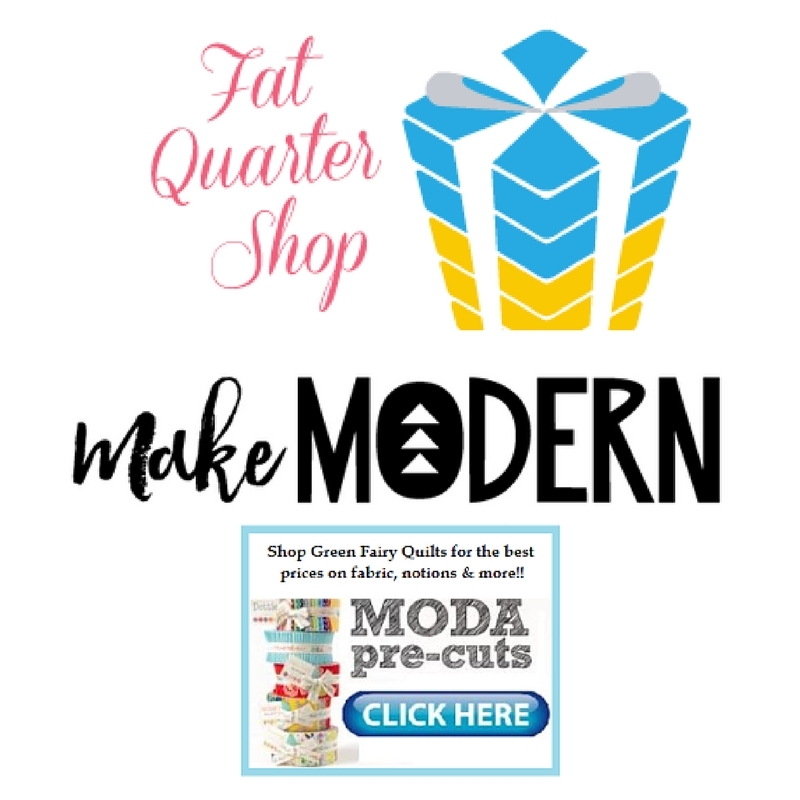 Green Fairy Quilts is offering a beautiful fat-eighth bundle of Puzzle Pieces by Moda for the 2Q bonus prize. 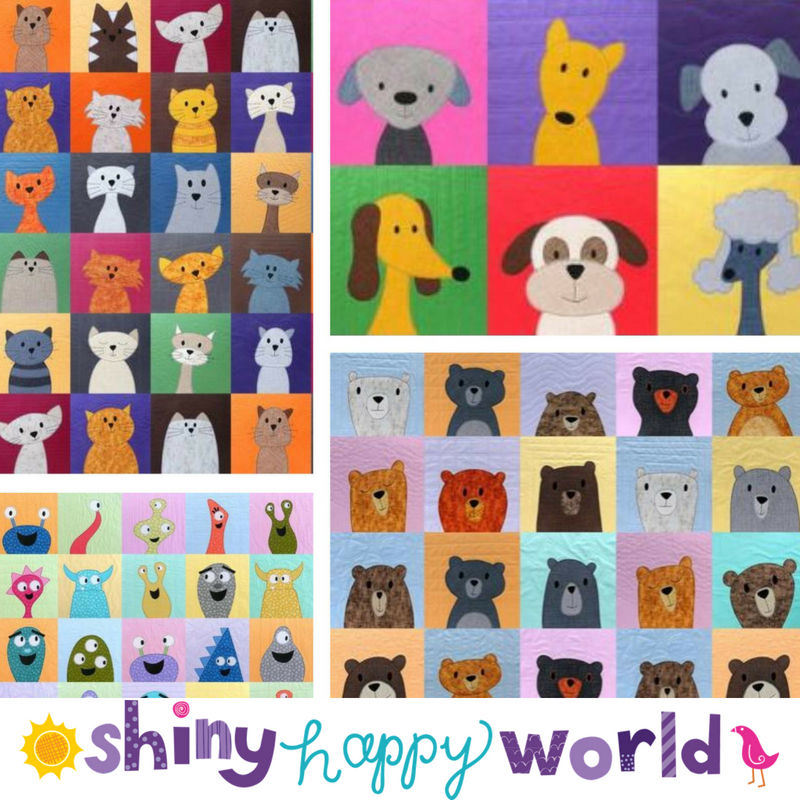 I am very excited to introduce our designer sponsor for June - Wendi Gratz of Shiny Happy World. (Isn't that just the best name!) Her patterns are so delightful - puppies, forest animals, monsters, bears, whimsical houses - each with a personality that you can't help but smile when you see them. And now there is a new pattern available called Fancy Doodads - hats, bow ties, glasses - anything you might need to dress up your bears, dogs and cats! 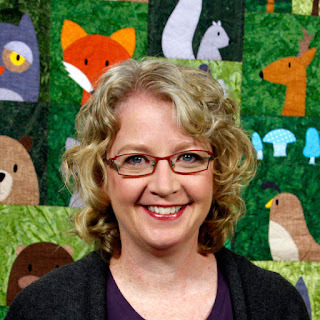 Wendi designs quilt patterns for beginners and creates videos of all the techniques required to complete the quilt to make sure the beginner quilter has everything they need to be successful. I love how Wendi focuses on breaking down the quilt making process into easy to understand steps. 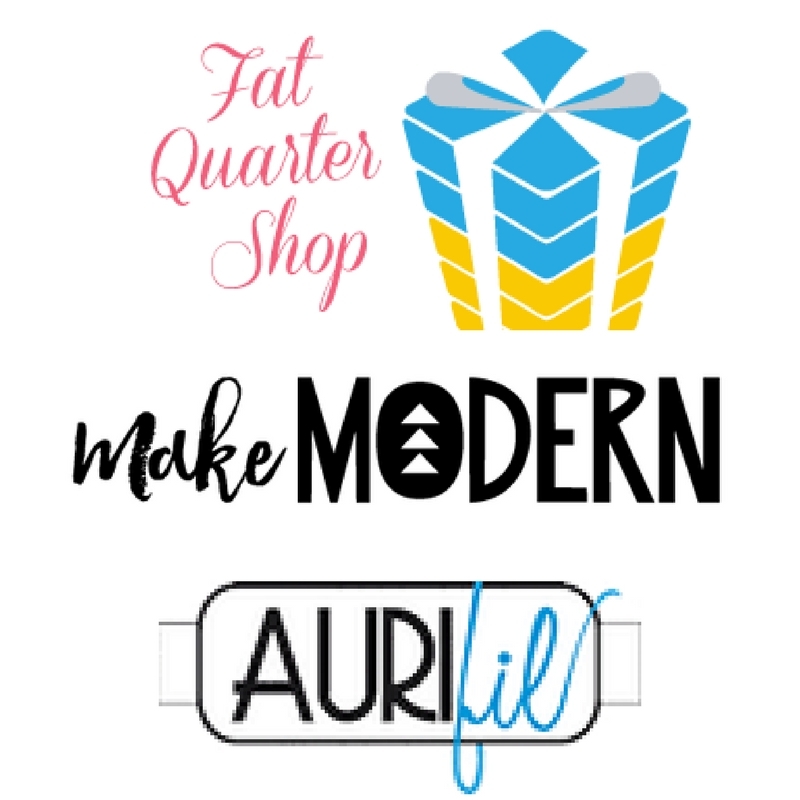 Her focus on fusible applique and the quilt as you go (QAYG) method of quilting help a quilter create something fun and fast. Wendi offers a free class called Let's Make a Quilt which is perfect for beginners and more experienced quilters too. Her latest pattern Bunches of Bears can be found with the rest of her patterns in her shop. Cuddly Cats, Playful Puppies, Scary Squares, and Bunches of Bears. Wendi is offering a $25 gift certificate to her shop to one lucky randomly chosen winner. You can visit Wendi on her blog, on Instagram, on Facebook and in her pattern store. My goal for June is to make a total of six of my double-wedding ring blocks - 3 to go! I am hand-piecing these and really enjoying the process. 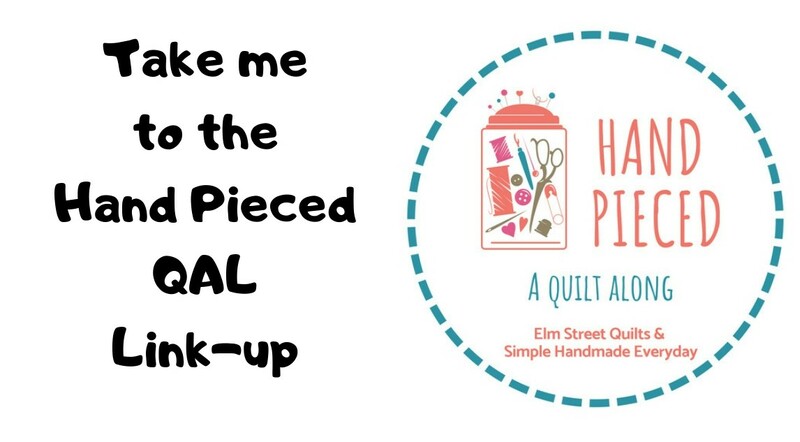 Elm Street Quilts One Monthly Goal June Linkup. Your wedding ring blocks are so bold and bright. I like having a hand sewing project going all the time....great take-a-long for when you are traveling or sitting at the Doctors office. Exactly. I am having so much fun with it and trying to decide how big to go with it! 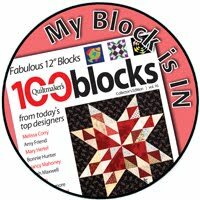 I'm impressed that you are hand piecing your blocks and I love the colours you are using. Aren't these colors just wonderful? I am in love with them! Thanks for the link up--I need the incentive--lol! Love your wedding ring blocks--so fun! i'm glad you've joined the link-up - it is fun to see what everyone is doing. And thanks on the DWR bocks! I like your double wedding ring. That is a lot of hand piecing! Wendi's patterns are really cute too. I love her patterns. I've done a bear block for a charity quilts and they were so much fun to make. What sweet hand pieced wedding ring blocks! Thanks, Sharon. They are so much fun to work on! Best wishes on your goal of hand-piecing 3 more wedding ring blocks. Thanks, Susan. Great to sit and hand-piece on the back porch on a nice day. Patty, I love your quilt blocks. Hand work seems like a good choice for summer. Enjoy! I’m glad you introduced Wendi as the designer of the month — I’m going to check out her patterns! Thanks, Tracie. Wendi's patterns are just so much fun. I'm looking for an excuse to make the monster one - such fun! Love your wedding rings, enjoy the stitching by hand! Oh I LOVE Wendi's Style!!!! So excited she's among the prize winnings this month. Enjoy making your wedding rings and thanks for the continued monthly motivational linky. Val, I'm glad you are part of the link-up. Aren't Wendi's patterns just delightful? And she has great videos too! Wow, you're HAND stitching those double wedding rings?! Very impressed. They look fantastic. Good luck with your summer sewing and thank you for hosting this linky party. This is my third time linking up a goal after failing to reach my goal the first two times... Wish me luck, and wish me fairies and elves to come in the night and help me get caught up with all of my projects!! I hope the fairies and elves stop by to help you - then send them by my house to do some cleaning so I can sew! Thanks for joining the link-up. Hand quilting is so beautiful and aren't they just the cutest bears. The bears and the puppies are just adorable! Those are such gorgeous blocks. Good luck with your OMG. Thanks so much. I'm really enjoying playing with all the color! Such lovely Double Wedding Ring blocks, DWR is one of my all time favourite quilts. 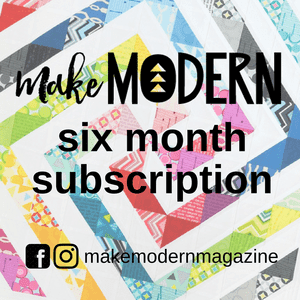 A BIG THANK YOU to you and Make Modern Magazine, I'm so excited to have won the May prize subscription to this mag. Congrats again to you. You'll love the magazine! Am intrigued by the wedding rings, what would be the symbolic behind it? Making 6 by hand is quite a challenge indeed, would there be a special reason to make 6? Love Wendi's work and am going to treat myself to at least one of her patterns, they are sooooo sweet. Nothing symbolic at all. 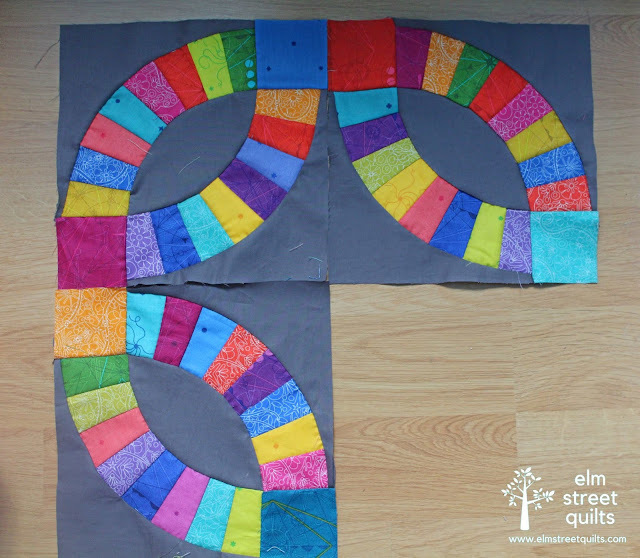 I'm making a wall hanging and 6 seems like the right number - at least as a goal for June! I'm glad you love Wendi's patterns - you will have a lot of fun making her a quilt! Patti is the link up closed for June. I want to add mine. Rita, I'm sorry you missed the link-up. It always closes on the 7th of the month a few minutes before midnight eastern time zone.